FILE PHOTO: French Finance Minister Bruno Le Maire meets with Greek Prime Minister Alexis Tsipras (not pictured) at Maximos Mansion in Athens, Greece, June 12, 2017. PARIS - France will discuss the possible sale of more Rafale aircrafts with Egyptian leader Abdel Fattah al-Sisi during his visit to Paris this week, Finance Minister Bruno Le Maire told Europe 1 radio on Tuesday. Under the previous government, France had concluded several major military agreements with Egypt, including the sale of 24 Rafale combat aircraft, a multi-mission frigate and two Mistral warships in contracts worth some 6 billion euros. The 2015 Rafale contract - the first export contract for the jet - included the option of selling another twelve aircrafts. “If there can be new contracts, so much the better. That will be discussed today by the President of the Republic (Macron) and the president (Sisi),” said Le Maire, when asked by Europe 1 radio to comment on reports that the sale of the extra 12 aircrafts was on the table but that his ministry was reluctant because of the payment terms asked for by Egypt. 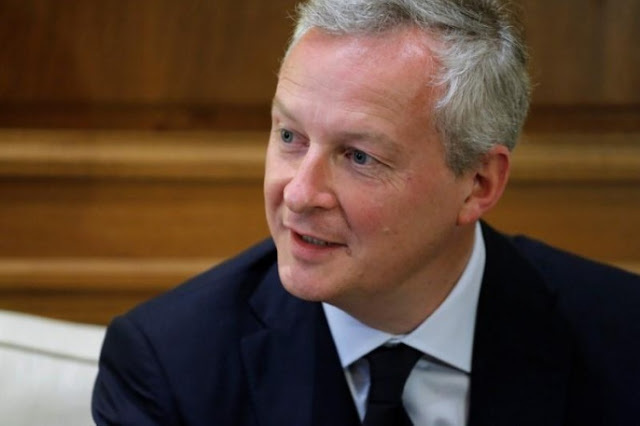 “It is normal that Bercy (the French finance ministry) would want to make sure Egypt should be able to pay its plane orders,” Le Maire said. Sisi is in Paris until Oct 25. “As far as human rights are concerned, of course we’ll discuss that. I have no doubt that the President of the Republic will mention the issue of human rights when he has lunch with his Egyptian counterpart,” added Le Maire. Rafale-maker Dassault Aviation declined to comment. France and Egypt have nurtured closer economic and military ties in recent years, and with Sisi’s rise to power that relationship has improved with both sides concerned by the political vacuum in Libya and the threat from jihadist groups in Egypt. But human rights organisations at home and overseas have accused France under Macron of remaining silent in the face of increasing violations of freedoms by Sisi’s government, as the 2018 presidential elections approach. France will discuss the possible sale of more Rafale aircrafts with Egyptian leader Abdel Fattah al-Sisi during his visit to Paris this week, Finance Minister Bruno Le Maire told Europe 1 radio on Tuesday. Under the previous government, France had concluded several major military agreements with Egypt, including the sale of 24 Rafale combat aircraft, a multi-mission frigate and two Mistral warships in contracts worth some 6 billion euros.